PR-756MC - Weight Capacity 375 lbs. PR-756MC - Overall Width 36.5 in. PR-756MC - Overall Height 44 in. PR-756MC - Width Between Arms 20 in. PR-756MC - Floor to Top of Seat 19 in. PR-756MC - Seat Depth 21 in. PR-756MC - Seat to Top of Back 29 in. PR-756MC - Distance Required from Wall Reclined 25 in. PR-756MC - User Height (suggested) 5'4" - 5-10"
PR-756L - Weight Capacity 375 lbs. PR-756L - Overall Width 39 in. PR-756L - Overall Height 46 in. PR-756L - Width Between Arms 22 in. PR-756L - Floor to Top of Seat 20.5 in. PR-756L - Seat Depth 22 in. PR-756L - Seat to Top of Back 30 in. 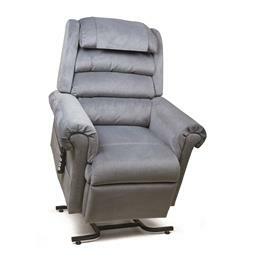 PR-756L - Distance Required from Wall Reclined 27 in. PR-756L - User Height (suggested) 5'11" - 6'2"